As I was loading my old green REI backpack down for our trip to the tropics back in the fall, I started taking stock of the broken zippers, busted clips, and frayed seams dotting the pack’s landscape. I realized that I have had that pack for 10 years and, while I still trust it as a great travel companion when I need to check a bag, I subconsciously started to think about finding a new pack. I didn’t make any moves, however, until I was contacted by My Trail Company about testing out their Backpack Light 70 model. Because my adventures tend to come in all shapes and sizes, I liked the idea of a pack that was adaptable to suit day hikes as well as extended backcountry trips. 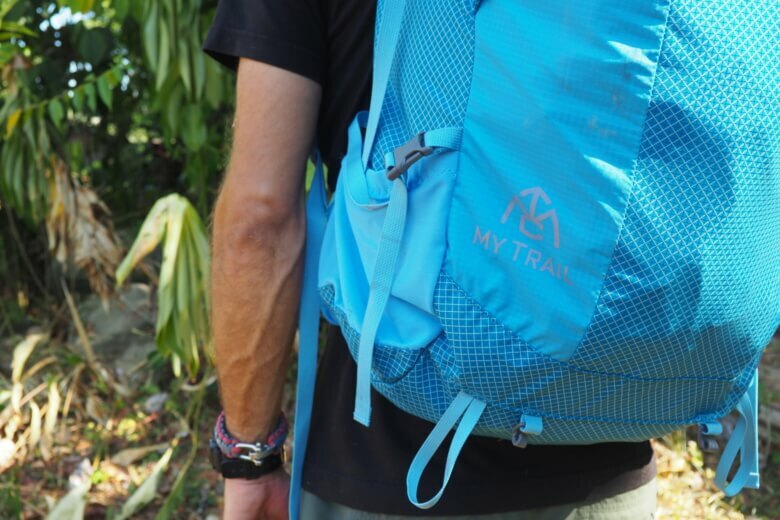 I agreed to test and review the My Trail Company Backpack Light 70 this spring here in Costa Rica. This review provides an overview of the pack and its features, how I’ve tested it thus far, my test results, and my final conclusion on the best uses for this pack. I hope you find my insights useful if you’re looking for a new, multi-purpose backpack. Side note: If you’re interested in other reviews, be sure to check out my Outdoor Gear page for reviews on water filters, tents, hiking shoes, trekking poles, and more. Also, check out my other Backpack Reviews, including brands like Kelty, REI, and Gregory, if you’re in need of a new pack! The Backpack Light 70 offers a total of (you guessed it!) 70 liters of internal storage space and offers a total base weight of just 33.5 ounces. The maximum recommended load to carry in this pack is 40 pounds, which actually will help you pare down your gear to what you absolutely need, especially if you’re like me and tend to overpack. The interesting part about this pack is that it can be compacted down to a minimal carrying capacity of just 25 liters. This makes it useful for a casual day hike to a local alpine lake while still maintaining its use as a multi-day backpacking pack. The pack’s main material is supplemented with white polyethylene Gridstop threads that boast an ultra-high molecular weight. This makes the pack’s material three times stronger than Kevlar and 15x stronger than steel. Features of the Backpack Light 70 include dual compartment front hip pockets, a roll-top closure, and a large front pouch with U-shaped zipper to store light, everyday items that you need easy access to while on the trail. Additionally, this My Trail Company pack boasts an internal mesh hydration sleeve, twin ice axe retention loops, contoured foam shoulder straps with lifter straps, extra-long compression straps to accommodate external loads, and an adjustable stretch sternum strap with reflective tab and emergency whistle. This pack is available in small, medium, and large sizes. For your convenience, I’ve placed a screenshot of the pack’s sizing recommendations below. My first major test of the My Trail Company Backpack Light 70 came in the process of traveling from Houston to Costa Rica after the holidays. Instead of bringing my 10-year-old large REI backpack back again, I swapped it out for the My Trail pack to see if it could handle the journey. I filled it to the brim with new tools I wanted to bring down, a month’s worth of dog food for our pup, his dog bowl, my clothes, a new machete and pocket knife set, and a variety of small items and Christmas goodies. Then, I sent it along the conveyor belt and into the underneath storage compartment of our 747. I must admit, I had some reservations about sending a brand new pack as a checked bag, primarily because I wasn’t sure how it would hold up to being thrown around by the luggage attendants. Typically, when I check my backpacks I put a rain cover on them for an added layer of protection. This time, however, I had forgotten both of my rain covers back in Costa Rica, so that wasn’t an option. I’m happy to report that the pack arrived at baggage claim in San Jose without a scratch or tear on it. It held up beautifully to the rigors of air travel and the baby blue color I chose made it super easy to pick out among the sea of other checked baggage in the terminal. Now that we’re in Costa Rica, I love the adaptability of this backpack. I can use it for a day-long hike up to one of several local waterfalls or for an afternoon trip to the Whale’s Tail at low tide. Not only can this pack handle up to 70 liters when traveling, but it’s also a super convenient day pack. It’s rare to find a pack that has this type of versatility. It can go from being your best friend on a multi-day backpacking trip to being a comfortable companion on a day trip to a nearby peak. The pack’s compression straps, harness system, and load lifter straps make it easy to adjust for comfort no matter how much weight you’ve loaded in it. The pack’s large exterior pocket makes it easy to store maps, multi-tools, and smaller clothing items in an easily accessible place. The large main compartment offers a place to hang and secure a hydration bladder or a sleeve to protect a good book if you don’t opt to bring along a bladder. Additionally, I love the large size of the mesh water bottle pockets on either side of the pack. They give me plenty of room to store a water bottle and slide in trekking poles, tent components, a hatchet or machete, or any other long, skinny items that wouldn’t really fit comfortably in the main compartment. Lastly, the pack features two loops and hooks at the bottom for the attachment of any additional gear. 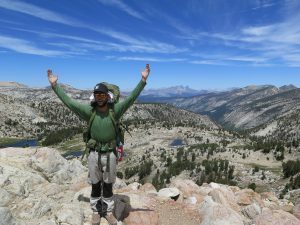 This is a great “do-everything” pack that I’m really excited to put into use once backpacking season swings into full force and I’m back in Lake Tahoe looking to take advantage of the accessibility of the beautiful Sierra Nevada mountains. As a frequent hiker in the spring, summer, and fall months, I often have several packs in the back of my car so that I’m ready for any type and size of adventure. Now that I have this pack, however, I feel like I don’t really need to keep multiple packs on hand at all times. If I get a call about heading up to catch the sunset from a nearby lookout point, this pack will be easy to load and sling on. If I set up a multi-day backpacking trip on the PCT, I’m confident that all my backpacking gear will fit nicely and this pack can handle the weight comfortably. While I will undoubtedly be crafting a more thorough review once I finally take the My Trail Company Backpack Light 70 out for a few backpacking trips in the mountains, I have to admit that it suits my travel and day hiking needs quite nicely here in Costa Rica. The only drawback that I might point out in this pack is the lack of a brain compartment. This means that aside from the two mesh water bottle pockets on the sides and the two smaller hip pockets, there are really only two larger compartments in which you can organize gear. For someone like me who tends to compartmentalize most of my gear before I even load it into my pack, this really isn’t a problem at all. In fact, it simplifies the process considerably. But for someone looking for a plethora of compartments and pockets in which to store gear, this pack will force you to simplify your organization process. True to its name, it will make you ‘backpack light’. As The Backpack Guide, I’m always looking for new trails and wildernesses to explore and I’m also interested in the experiences of others in the wild. If there is one thing I am sure of it’s that we can all spend more time enjoying and connecting with Nature. What is your go-to, all-purpose pack? I’d love to know which brand (or brands) you trust with your gear on day hikes, overnights, and multi-day excursions. Also, I’d love you to hear which brands you’d recommend investing in down the road. If you’ve compared the My Trail Company Backpack Light 70 to other similar packs, how do you feel it stacks up? 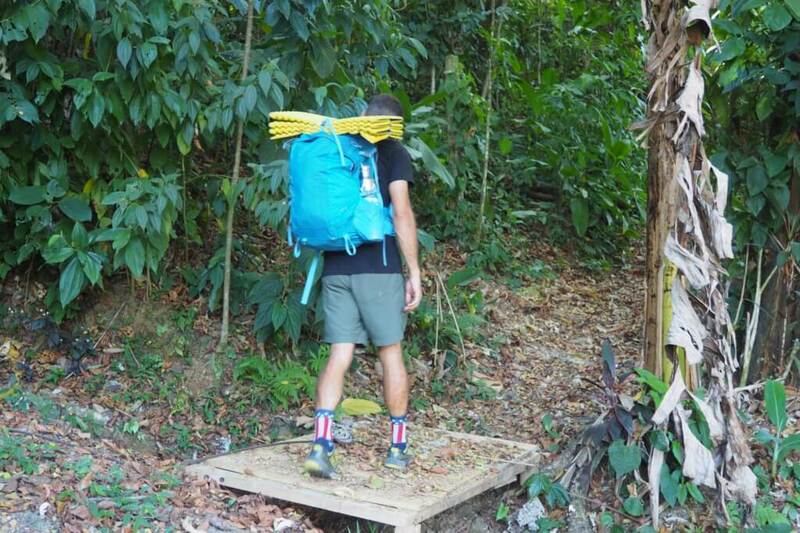 If you decide to purchase the My Trail Company Backpack Light 70 after reading this review, I’d love to hear about your experience once you’ve had a chance to test the product out! Feel free to reach out to me directly (email below), or share your latest adventure or backpack by tagging @thebackpackguide on Instagram! I hope you’ve enjoyed this review and I’d love to hear your feedback in the comments section below. I’ll be quick to reply to any questions, comments, or concerns you feel like sharing! I have the UL 35 and the Lite 50 from My Trail Co, and find that they are exactly what I need. I only own those two and one 18L day pack that I mostly use to travel to work lol. I plan to take the Lite 50 on my AT thru-hike this year just because it is so comfortable, durable and has plenty of room for my gear (I’m pretty minimalist). I think you are very accurate in your review, though I personally love that there is no brain on the pack, as I took it off the last one I owned that had one lol. Thanks for the comment! I’d love to hear how it performs on your AT thru-hike. My plan is to utilize it for a week or two on the Tahoe Rim Trail this summer. What’s the longest trip you’ve done with the Lite 50 so far? I have a heavy duty one that I use for my daily commute. Since I ride a motorcycle to work, I need one that can slide on pavement in case I have one of those pesky unscheduled dismounts. It holds my laptop, and more importantly – my lunch! But on the weekends, I like to have a backpack when I’m out with my family. Not only for trips, but for days in the park, or the zoo, or an amusement park. Iike to pack snacks, wallets, keys, etc. I need something lighter, and I seem to have to buy one every year, because I buy cheap ones. Might have to plunk down some cash on a good one though. We have a weekend camping trip coming up soon, do you think this would be a good one for that? I’m not sure if a lack of compartments is a good or a bad thing though. The cool part about this backpack is that it is highly versatile. It would be great for a weekend camping trip and still useful for days in the park, at the zoo, or at an amusement park. If the 70-liter version is a little big for you, you might think about looking at one of My Trail Company’s smaller options. Here’s a link to all of their offerings: http://bit.ly/2TpP8PE. They’re currently offering up to 70% off on certain items in their store. This pack, for example, is on sale for just $164 right now! The first Backpack I owned was one I bought from the university I attended. It was a scholastic one and a little heavier than The Backpack Light 70 I think. It still suited my travel needs but I did not go walking with it for long periods of time with it, such as trailing the Costa Rican coast. I think I would need a more efficient one for that activity. I am current am using a second-hand Backpack. It gets the job done but I certainly would not mind possessing one of higher quality. Great review, thank you, and just about as timely as can be as like your own trusty steed my own 70ltr is about 10 years old and seen far better days. Consequently I am sadly due to dispatch her into the waste and am now looking for a new travel companion. The Back-pack light is definitely a contender, and had made it to my look-at-list especially having read your review. The daypack capabilities were something that I didn’t know about and, like with yourself, I find a major plus. So best i start giving it a serious look. Whoa! Similar situations! I had a 70-liter REI pack that I loved (it’s done the JMT with me and numerous other trips), but it was looking pretty well worn and I found this new pack from My Trail Company to be quite the steal. They’re currently offering it for almost 70% off on their website, for what it’s worth! Hi! I like a backpack that’s versatile. That can be taken for short hikes, and also for adventures that last more than a couple of days. And I’m glad I’ve read your post because you’re also looking for exactly that. I like the way it simplifies things in two main compartments. For me the simpler, the better. I also really like the cool light blue color! Have a good time in Costa Rica. And thank you very much for this review! Hey Henry! I agree with the benefits of simplicity. I’m glad you enjoyed the review and I’d love to hear from you if there are any topics for hiking tips, trail recommendations, or gear reviews you’d be interested in me covering on this blog! This is a strong backpack I’ve ever seen. This is great. I’ll like you to share your experience when you washed the backpack. Because like other ones I’ve used, after washing they start losing qualities. The bag is for all purprosoe. The durability of the harness and zips are very important, for what I’ve read so far, the backpack is super strong. I’ll love to get one. Hi Marshall! How have you washed your backpacks in the past? Some shouldn’t be put through the washing machine and can lose a good bit of your waterproofing if they are. That gives me a great idea for a new blog. ‘Tips for Washing Your Backpack’. Thanks!